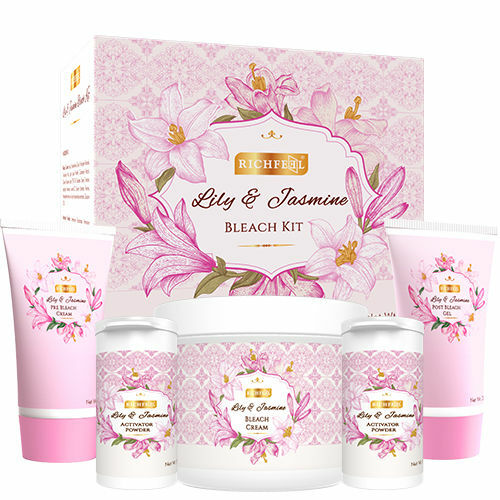 Our one of a kind floral bleach is enriched with extracts of jasmine and lily. Jasmine flowers stimulate cellular renewal and lilies soften, moisturize and soothe inflamed skin. Their medicinal properties are said to restore your skins moisture , promote a natural radiant complexion and give you a healthier look and feel. It also leaves you with a gentle fragrance. Indulge yourself in our floral essences. How to Use Wash your face with soap and cold water.Pat dry. Mix 2 spatulas of bleach cream with 2 pinches of activator powder. The approximate ratio of proportion should be 5 (cream): 1 (activator). Mix cream and activator till powder completely dissolves in cream. Use the spatula to apply the mixture on desired areas avoiding eye brows and around the eyes. Allow the mixture to remain on the skin for 10 - 15 minutes. Wash off with normal water.Pat dry. Apply post bleach gel and massage gently till it gets absorbed. Special Features Reduces dark spots, promotes instant glow, get rid of dead skin cells, cleans deeply, improves skin elasticity, acts as an anti - oxidant.